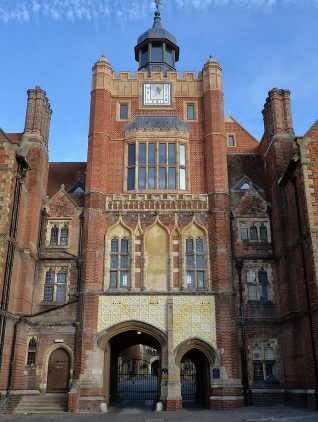 Brighton college recently unveiled a new gatehouse tower which was delayed by over a hundred and twenty five years due to lack of funds. 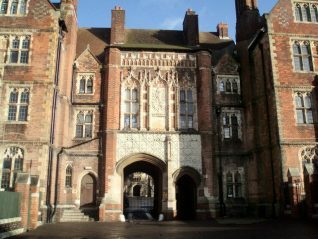 Founded in 1845 by William Aldwin Soames, who collected a group of likeminded local citizens to join him in the task, Brighton College was the first public school to be founded in Sussex. It has gothic revival buildings by Sir George Gilbert Scott RA (flint with stone dressings, 1848-66) and Sir Thomas Graham Jackson RA (brick with terracotta dressings, 1883-1887; flint with stone dressings 1922-1923). The Gatehouse Tower, designed by Sir Thomas Graham Jackson was supposed to be the final touch to his 19th century additions to the college, but his creation was never finished because of a lack of available finance. 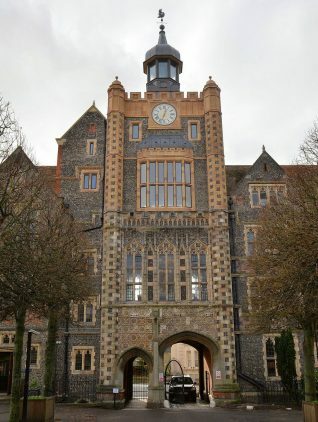 Last year, historic building specialists were engaged by Brighton College to complete the original design of the tower; it was financed completely by donations. The tower features a sundial on the front entrance and a clock on the inner courtyard. I studied in Brighton Technical College from 1960 to 1963. I fondly remember Mr. A.J. Till, the head of Mechanical Engineering department, and lecturers like Tom Smith, Harry J. Smith, Turner. Principal was Dr. Watts. The gatehouse before renovation looks familiar. I must confess I never looked up so I can’t recall the upper part of the picture. Wish I had because the architecture is so beautiful. I guess the cold made me tuck my chin in. Any pictures of St. Peter’s Church across the road?